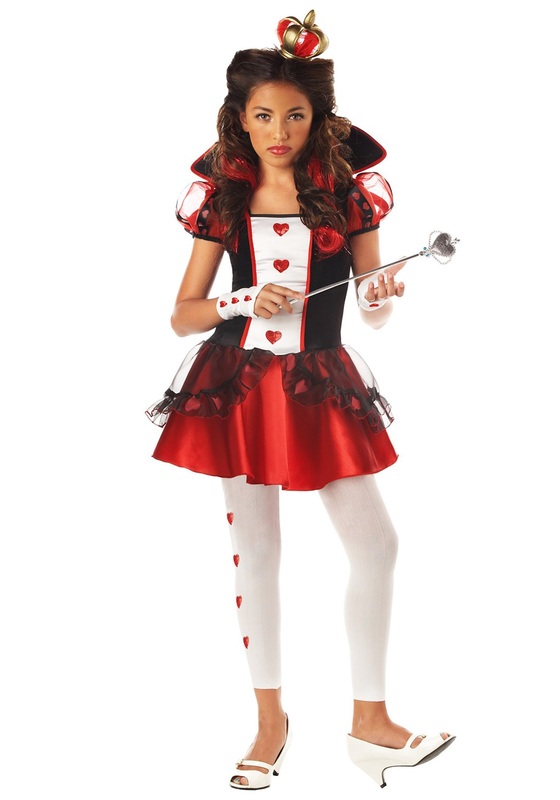 Dressing up as the Queen of Hearts is every tween's dream! Not only are you the ruler of an entire kingdom but you also get to be one of the quirky fictional characters from the amazing fantasy world of Wonderland. Now with this great Alice in Wonderland themed costume, any teen can get a taste of kookiness and royalty this Halloween! This cute costume includes a black, velour dress made from polyester. The dress has an attached stand-up collar that is lined in red and made from foam to ensure it maintains its shape. A white satin-like inset lines the torso with red sequined hearts and also has a lovely blood-red trim. The short sleeves are made from sheer red material and decorated with black ribbon that features even more red hearts. The sleeves are also lined with elastic to give them a cute puffy look. The red shimmering skirt has a sheer black overlay with red hearts. The white leggings also feature red hearts down the side which are made from a spandex and nylon blend. Matching white glovelettes with a handful of hearts are also included. Then, of course, you have a crown that completes this royal costume. The plastic gold crown is stuffed with red netting and has two small elastic loops making it easy to bobby pin the crown in place (please note the bobby pins are not included). Make heads roll at your next Halloween party and have everyone following your every command in this Tween Queen of Hearts costume!